*Do you also need to connect a fridge line to the filter? *Would you like Leak/Flood Protection? 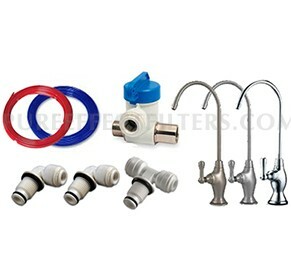 This conversion kit allows you to simply turn your ULTRA Countertop filter into The ULTRA-UC Undercounter unit without having to buy a whole new system. This kit is for you if you own our ULTRA Countertop filter and decided you need more countertop space, want to connect a fridge line for clean and cold filtered water/ice or simply want a cleaner, more elegant look in your kitchen. This conversion kit makes it possible to turn your countertop system into an out-of-sight undercounter unit. Please ensure you have (or can drill) a 1/2" diameter hole in your sink for installing the dedicated faucet that comes with this kit (existing soap dispenser, sprayer hose, or pre-drilled holes can also be used).